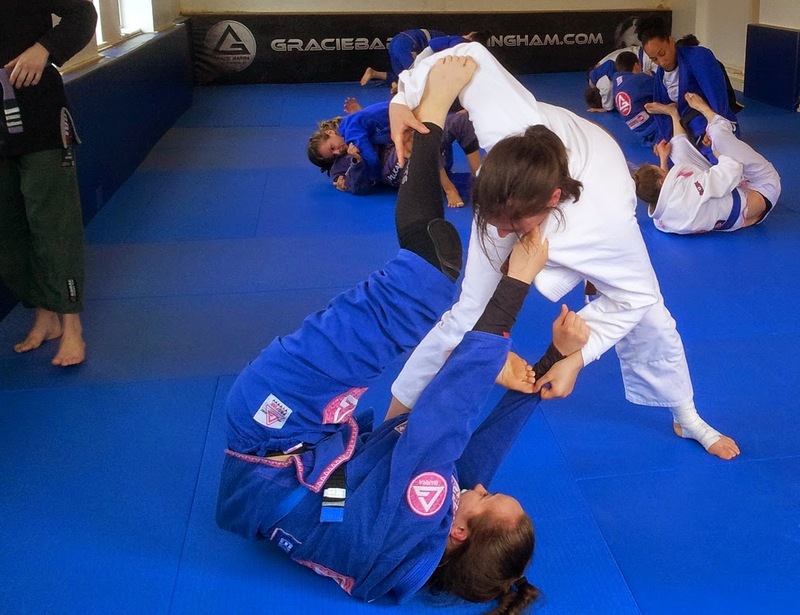 The numbers of women competing in BJJ has been increasing, with some representatives from the UK achieving impressive results on the big stage. 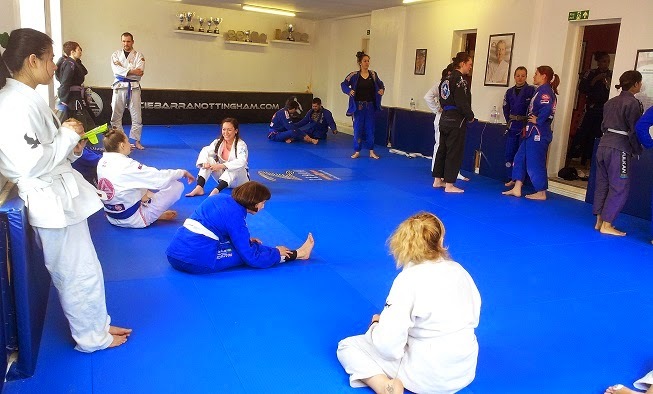 To help fund the not inconsiderable costs of competing at the IBJJF World Championships (27th-31st May 2015), four of those success stories decided to offer a seminar at Gracie Barra Nottingham, for a very reasonable £20. Black belt Yas Wilson is someone I already know, having first trained with her in 2007 at RGA HQ. Yas, who is Roger Gracie's first female black belt, has a lot of accolades to her name, including a brown belt gold at the 2013 Worlds. That same year, Vanessa English won gold at purple belt, while Gret Zoeller was on the podium in her brown belt division too, winnning bronze. Leoni Munslow's trophy case is also well stocked, most recently featuring a silver at this year's European Championship as a brown belt along with a nogi Euros gold. Beyond their great tournament results, all four are excellent teachers: Yas and Gret are both black belts now, while Leoni and Vanessa are brown belts. It was therefore cool to get a chance to learn from them, especially as Yas was the only one I had met and trained with before. I was also keen to encourage some of the students from my women's class to pop up too: although this was a co-ed seminar (I was one of about five men there, IIRC), it was a particularly good opportunity for female students to network and train with other women. Thanks to Laura very kindly offering to take us in her car, four of us from Artemis BJJ made the journey to Nottingham. There have been women only open mats running across the UK for several years, with a strong presence in London (the Facebook group looks to be more current than the page), the South West and probably lots of others I'm not aware of (feel free to add a comment if you known of any others in the UK). The US has loads as well, often highlighted and supported by Fenom Kimonos. Hopefully the Super Seminar will become a regular event too, with future editions already planned for London and Manchester. I'm not sure where the main updates will be, but for the moment you could keep an eye on the Facebook event page (which also has lots of pictures from the seminar). The Super Seminar had support from several BJJ companies, meaning the raffle was crammed with prizes. Tatami Fightwear (who I think also sponsor at least three of the instructors) is always ready to give back to the community, on this occasion providing gis and caps. Idee Pure sent some soaps along too, plus there was another stall selling various healthy looking stuff with all proceeds going to support the instructors. The four instructors split the teaching between them, each focusing on a different area, mainly guard. 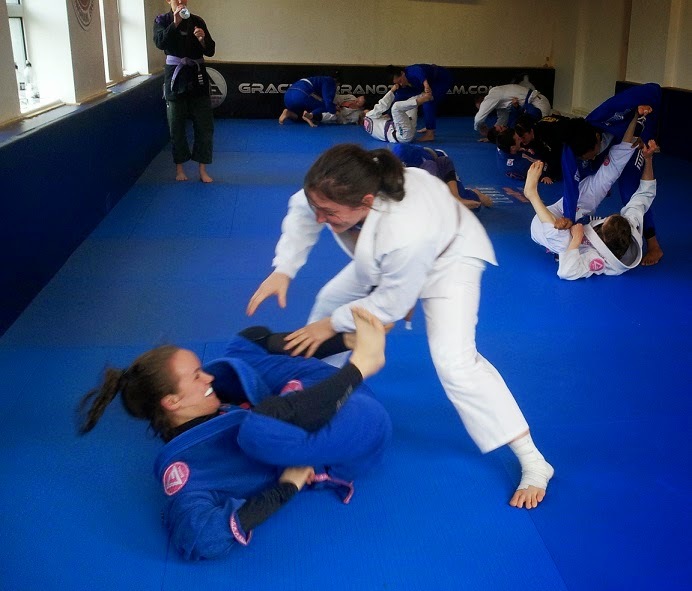 Leoni was the exception, drawing upon her judo background to go through some takedowns. The first one reminded me a bit of the Roy Dean style single leg off Blue Belt Requirements, where after you shoot in, you hook a leg behind theirs and drive through. That's probably my favourite takedown (though I say this as somebody who pretty much never does takedowns). Leoni's version starts with the usual collar and elbow grip. Pull on one side to get them to step a foot towards you, then immediately hook that leg and drop, driving through to knock them over. My drilling partner, David, emphasised really hooking that leg: I was initially just putting my foot behind and driving, whereas it's more effective to wrap further, enabling you lock their lower leg between your foot and shin. That seemed to add a bit more leverage when you drive. You end in top half guard, ready to pass. Next was a hip throw, to which Leoni added some handy details, like the importance of maintaining the sleeve grip. Keeping hold of that arm can lead right into an armbar, especially if as you execute the throw their arm goes under your armpit (if it doesn't, it's still easy enough to switch your grip to control the wrist as they hit the floor). It also means you can adjust how hard they land. Leoni also showed how you can make it more effective by swinging your leg back. Switching to closed guard, Yas detailed two solid options off the two-on-one grip break. Start by grabbing their opposite sleeve, then bring your same side hand underneath. You're looking to grab your wrist, using the combined power of your two hands to punch up and break their hold on your gi. Maintaining your sleeve grip, stiff-arm it away from you to turn them slightly, then capitalise by using your other hand to grasp their armpit. Lock your elbow against their back, which combined with the armpit grip and stiff-arming the sleeve should twist their torso. That puts you in a great position to take their back. Staying tight to their back, release your grip on their sleeve in order to post on your elbow (ideally transitioning to your hand for improved base). Swivel your body around to their back, putting your knee on the mat. As Yas said, often people will look to establish an initial back control hook here, aiming to put in both hooks as they rotate around to the back. Instead, Yas suggests bringing your foot across their thigh, crossing the other foot on the other side of that thigh. Crossing your feet around their thigh makes for a secure hold, facilitating your roll into back control. While you want to avoid crossing your feet in between their legs (because they can footlock you from there), crossing by the thigh looks to be safe. It also makes for an easy transition into a body triangle, if you like that position. In terms of the grip on the sleeve you're stiff-arming (i.e., straightening your arm to use skeletal rather than muscular strength), that's going to vary depending on your preference. I usually prefer the pistol grip (where you grab a load of gi in your fist, like you were holding a pistol), though it isn't as strong as the pocket grip (your thumb folds the sleeve over your fingers, creating the titular 'pocket'). The advantage of the pistol grip is that it's a lot less rough on the fingers than a pocket grip. However, I was finding that when I stiff-armed the sleeve away, my hand got twisted into an awkward position using my pistol grip. So a pocket grip is probably preferable, unless you switch your hands in the initial two-on-one grip break configuration, then pass the sleeve to your other hand for the stiff-arm. That way you can get a comfortable grip, but it risks them freeing their sleeve during the grip change (and adds an extra step to the technique). If they are wise to that back take, they may post on their leg as you try to move around, using their weight to prevent you swivelling to their back. Yas has an answer for that, full of armbar goodness. Put your foot into the hip of their raised leg. That gives you the leverage to push and turn your body. As you turn, you want to simultaneously move both your other leg and the arm you reached around their back. The leg is going to slide into their armpit, while the elbow of your reaching arm shaves closely past their head, in order to press against their neck. You can then use your arm to help shove their head back as you bring your first leg over. From there you're perfectly placed for an armbar. Their arm is already controlled because of your initial sleeve grip (from that grip break), so just extend your hips and pull down on the wrist. I found it helpful to lift my hips for that swivel, though you have to be careful you don't leave them any space to wriggle free. Making sure the arm stays really close to the head as you shave it past is important. That ensures their head is tucked out of the way for when you want to bring your leg across. Third in line was black belt Gret Zoeller, a veteran grappler with fourteen years experience, presenting half guard. She shared a technique she first learned in 2003, from the legendary half guard pioneer, Roberto 'Gordo' Correira. Before getting on to the details, she gave us some history on the half guard, as well as this particular sweep. It turns out Gret used to train with Ben Poppleton, a name I don't hear as much these days, but a significant figure in the early years of UK BJJ, especially in the North (he's since moved to teach in the rather sunnier setting of Tenerife). Gordo had great success with this technique as a competitor. I refer to it as the toe grab sweep, but it's often called 'old school', thanks to Eddie Bravo. Gret covered two versions. They both started the same, blocking the cross face and circling your other arm around for the underhook. That was followed by reaching your cross-face block under their same side leg, in order to grab their ankle and pull it up. You can then bring your underhook arm under their bum, switching grips so the underhook hand grasps their foot. The two version diverge at this point. In the first version, your free hand grips their knee, then you drive forward to go on top. In the second, you tweak out their non-gripped leg first, then drive through, the same way Jason Scully teaches it. My preference is the second, which has the further advantage that you can take their back if for some reason you can't knock them to their back. I also find it easier to disentangle my leg with the second option, but they're both effective. Gret progressed into something she's been playing with recently (thanks to her evocative choice of metaphor, this one surely needs to be known as the Jane Fonda sweep ;D). The situation is that you're under half guard and they've squashed you flat. You can't get on your side, ruling out a lot of the main options from the bottom. Instead, you're going to pull out their gi lapel and pass it over their back, to your other hand. I'm not sure I'm remembering rightly, but I think you use that to make some space and shrimp out slightly. With your free hand, reach underneath until you can get your arm to their far knee, wrapping around the outside. You will normally have a leg locked over the back of theirs: keep that in place, but the other leg is going to swing as part of the sweep. The motion for the sweep is where Fonda comes in. Sadly I couldn't find a clip of Ms Fonda demonstrating driving a big truck (though I did enjoy this awesomely '80s workout, complete with random singing), but basically imagine you are trying to turn a huge steering wheel. Pull with the gi lapel grip and lift with your leg grip, also swinging your free leg. This shouldn't take a huge amount of effort, so if you're straining you probably need to adjust something. I was finding that when I asked my drilling partner to apply some pressure on top, I generally had to try twice, getting the sweep on the second attempt after creating some momentum with the first. I realised I was gripping incorrectly on the leg after Gret came over during drilling: rather than grasping the gi material, you can hook your arm around the leg instead. That's much easier, especially if the material around their knee isn't loose. Vanessa closed the technique portion of the seminar with a sweep from spider guard. If you're in closed guard, to move them to open guard, grab both their sleeves then put your feet on their hips. Extend your legs, at which point they will normally stand (if they don't you've got options like the triangle here). Put one foot into their same side bicep, then loop your other leg around their arm in a lasso, reaching your toes to their shoulder blade. You can then pull them in, switching your grip from the lasso to their same side collar. Swivel your body towards them, so you're facing your bicep-pushing foot. If they don't do anything at this point, contract by pulling them in, then kick out your bicep foot and roll them over (you'll probably find your knee goes across their stomach too). More likely, they will try to go to knee on belly as soon as you present your side to them. They aren't going to be able to settle because you're still pushing their arm away with your extended leg. So, you can still roll through, but make sure you grab their leg. Using that grip, you can go straight into the leg drag position, shoving their leg down.